During the research for the book Astrid Carrapatoso / Edith Kürzinger (eds), Climate-resilient Development. Participatory Solutions from Developing Countries, Routledge/Earthscan in autumn 2013, (based on the outcome of the 3 sessions of the WG organised at GC 2011 in York) a few innovative topics have been developed which have a direct relationship to middle classes. The call for paper intends to get additional insight into these topics. Selected papers will be discussed in 2 – 3 working group sessions. Description: Unlike the actual UNFCCC process, which tries to negotiate global / national GHG reduction targets, we suggest to treat GHG as the symptom of the underlying root problem “the unsustainable production and consumption patterns”. These are mostly practiced by 250 – 300 mio. individual high emitters (in 4 major regions: OECD minus US, US, China, non OECD minus China )which generally belong to (elites and) middle classes. As these are the major cause for the problems (consumption of non renewable resources, climate change, wider disparities in income within and between societies), they need to be part of the solution. 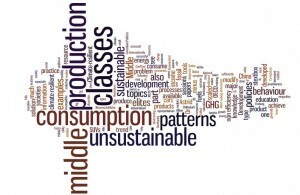 Much has been talked and published about sustainable consumption and production (SCP), but not much has happened so far to achieve tangible progress in making (elites and) middle classes in all types of societies reflect on and modify these patterns, incompatible with a climate-resilient development (CRD) strategy. Middle classes (and elites) are part of the problem (unsustainable development), hence must also be part of the solution at the national level, as well as at the global level. Is this type of information, knowledge, skills sufficiently available? Why (not)? Where are the gaps to cover? Why is this knowledge not widely used for a more sustainable behaviour and consumption patterns by the middle classes to provide the respective “good examples” or “trend setting” at home? Or why is such behaviour not scaled up nationally and internationally? What type of strategies, approaches, policies, tools could remediate this shortcoming? By whom would they have to be developed, implemented, enforced? Elites and middle classes also shape unsustainable production patterns, either as consumers through their demand (e.g. for air conditioners, sports utility vehicles (SUVs), mobility and housing behaviour) or as owners or managers of enterprises who produce unsustainable products (with short life span, un-repairable, difficult to recycle, etc.) and practice unsustainable production processes which consume huge amounts of GHG emitting fossil fuels or dangerous nuclear energy. How can the rebound effect be tackled, i.e. the incentive to consume / produce more, when resource efficiency of product and production makes more fossil fuels available, eventually at lower prices, and when growth in income allows for more (unsustainable( consumption? Where are successful examples and how can they be scaled-up and disseminated as top runner / best practice? 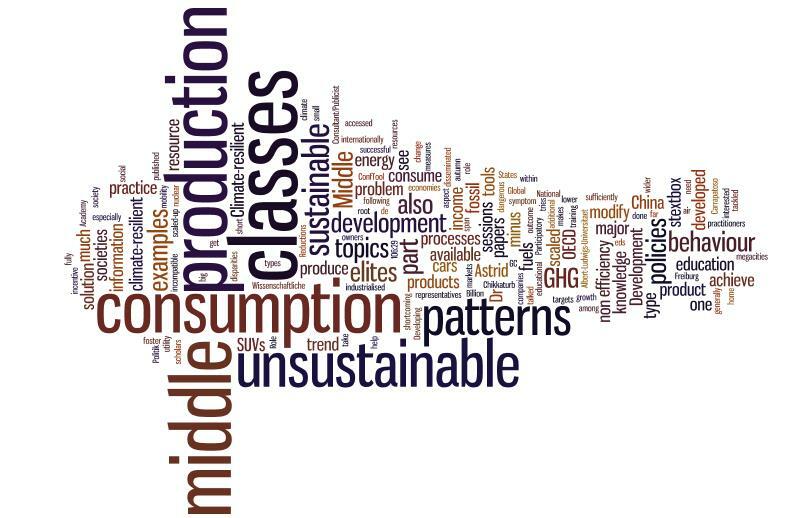 What economic, social, environmental or educational policies, practices, tools can be helpful to achieve more sustainable consumption and production by middle classes? When walking through megacities, one can see that developing economies simply copy the unsustainable consumption and production patterns from the industrialised countries? What policies and incentives could revert that trend? Where are examples which could be scaled up? Who would take which action? What role play education and civil society?